Uses: Art Display, Education, Elementary School, High School, Middle School, Schools Colors: Browns/Tan/Beige Lengths: 5 panel 9'-5", DT 3 Panel Display Tower Heights: 6'-5"
This photo shows how teachers used a combination of 6′-5″H Screenflex Light Duty Portable Room Dividers and a 3-sided Display Tower to showcase the talents of Coulter Grove school’s artists’ works. Why Use Screenflex Art Display Screens? 3-sided art display screens allow visitors to mingle around the display while viewing the artwork from all sides and the 2-sided from both sides. Both the 3-sided artwork display screens and the 2-sided artwork display screen easily accepts staples, pins or tacks. 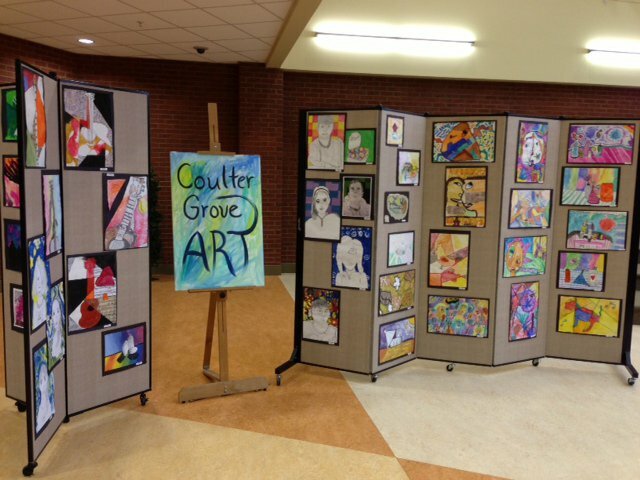 If you’d like to improve the look of your student art displays, call us today at 800-553-0110 for a quote or to get the names of Screenflex customers in your area.